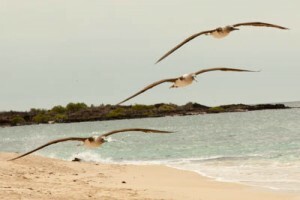 It was finally time for the “real” Galapagos, the uninhabited islands and the areas that can only be reached by boat. We met the rest of our group (12 in total) at the airport, and travelled by bus to the harbour, where our home for the next week were anchored. 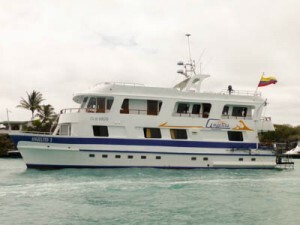 Angelito I has 8 passenger cabins, a crew of 8, a social/dinner/bar area on the second deck and a large sun deck on top. Our cabin was quite large with several cabinets and a surprisingly big bathroom. We were very lucky with our group, and quickly became friends. Dave and Jan, Alex and Catherine were from England, Rosemary and Tony from Australia, Max from Germany, Ann from France (but living in Australia) and Ashley (US) and Yuri (Spain) both lived in Ecuador. 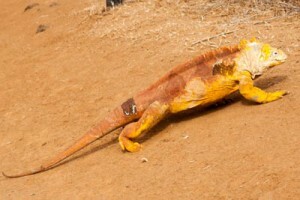 The Galapagos are an isolated group of volcanic islands about 1000 km from the Ecuador mainland on and close to the equator. The earliest islands visible today were formed 4 to 5 million years ago by underwater volcanoes erupting. 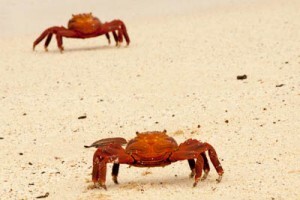 Until the discovery of the islands in 1535, the flora and fauna evolved in isolation, producing unique species not found anywhere else in the world. Charles Darwin visited the islands in 1835, and his observations here are a big part of his theory of evolution. 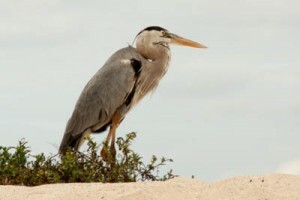 We had one landing the first day on Playa Las Bachas, located in the north of Santa Cruz island. 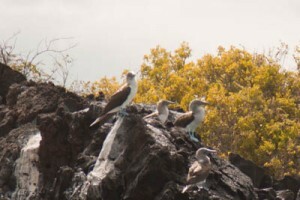 We were welcomed ashore by blue-footed boobies and pelicans, and on the walk along the beach we saw several marine iguanas, a couple of flamingos, frigatebirds, hundreds of crabs, yellow warbler and several other birds. Most of the passengers went for a swim before heading back to the boat. We anchored for the night outside the island Baltra, and had a great evening on the sundeck getting to know the rest of the group, while around 20 large frigatebirds were circling over the boat. Before lunch we visited Mosquera Islet, where there was a large sea-lion colony, and several of them were circling the boat when we arrived. 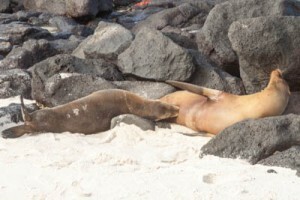 We saw hundreds of sea lions here, one was only about a week old and several were still nursed by their mothers. I think we all could have watched the young ones play in the water and on the beach all day. So cute! 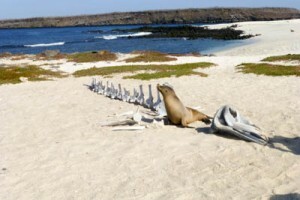 A large whale skeleton was laying on the beach (parts gathered by the guides) and there were plenty of birds and lizards. Back on the boat we got our wet suites and snorkelling equipment while watching sharks swim around the boat. We were snorkelling along the shore of North Seymore, and finally remembered to bring our GoPro. 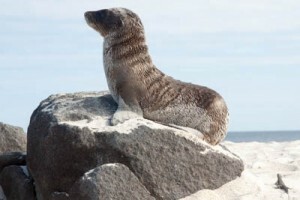 That was smart because we saw 3 white-tipped sharks, sea lions, a fur seal and plenty of fish. Amazing! 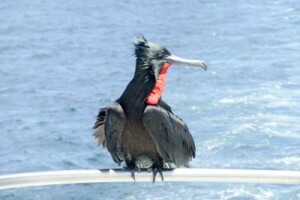 We had some time before the next landing, and spent most of it on the sun deck watching for wildlife. 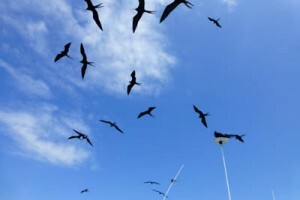 This time several frigatebirds were hitch-hiking on top of antennas and ropes to the next island while we were watching sea turtles around the boat. 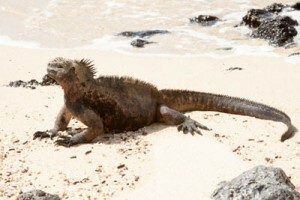 In the afternoon we went to Dragon Hill, where we saw several marine iguanas at the beach, and stilts and other birds in a lagoon on the way to a viewpoint. The sand here was very red, and it looked like we all had sun burned feet, but luckily the “sunburn” washed off easily. 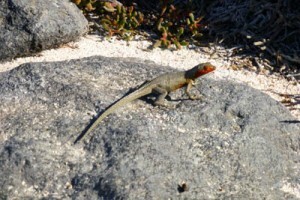 We walked through a cactus forest and saw a few large land iguanas partly hidden, but on the way back one of them was nice enough to cross the path right in front of us, and even take a break so that we could all take a few photos of it. We stopped for dinner outside Rabida Island, and spent the evening on deck whale watching (without seeing any whales), talking, laughing, watching a beautiful moon rise and sharing some Norwegian aquavite in the dark. What an amazing day! We fell asleep to the sound of the engine, since we had 12 hours of sailing to do before breakfast. We crossed the equator twice during the night.